We are excited to announce we are looking for outstanding high school seniors to join us for the 2nd Annual Washington State STEM Signing Day 2019. We are excited to announce we are looking for outstanding high school seniors to join us for the 2nd Annual Washington State STEM Signing Day! All Washington high school seniors who plan to pursue a STEM degree or career are eligible to apply. Just like signing days for athletes, the 2nd Annual Washington State Science, Technology, Engineering, and Mathematics (STEM) Signing Day on April 12, 2019 will celebrate high school seniors from across the state as they make their commitments to continuing education programs focusing on STEM. This year we are excited to host this event in Olympia! What is STEM Signing Day? There is a high demand for STEM talent in Washington. 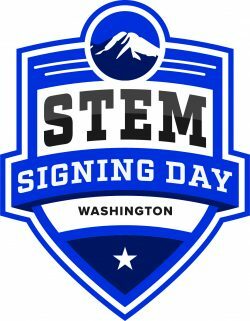 Boeing is proud to partner with Washington STEM to host the 2nd STEM signing day which will recognize, celebrate, and honor high school seniors who are interested in pursuing a degree or career in STEM. Students will sign “letters of intent” to their chosen STEM field. Travel Assistance: For those on the west side of the mountains, travel support to Olympia will be available for the students and chaperones. For those on the east side of the mountains, travel support plus one night in a hotel will be available for students and chaperones. Apply Today: To apply, fill out this simple application online. Students who apply by March 8 will receive top priority. If you have questions, please contact jayme@washingtonstem.org. Thank you! Washington students celebrate entering their postsecondary STEM education during Washington State STEM Signing Day. A Washington student celebrates entering her postsecondary STEM education during Washington State STEM Signing Day. State Superintendent Chris Rekydal joins Boeing and Washington STEM to celebrate student success during Washington State STEM Signing Day.